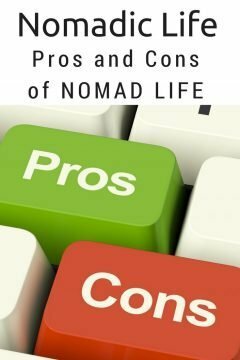 Home » Nomadic Life » Nomadic Lifestyle – Pros and Cons – Should I Go Nomadic? Nomadic Lifestyle – Pros and Cons – Should I Go Nomadic? Am I going nomadic? I have been tossing around the idea of turning my lifestyle nomadic for the past couple of years and now. I am taking some steps towards turning my dream of becoming location independent into a reality. Will I have the confidence to follow through? This whole idea of going nomadic started to take shape after my trip to Colombia in December 2012. I met several people who were long-term travelers – a year or more roaming the globe. Most were young people in their late teens or early twenties and they were getting by staying in dorm style accommodations and working a little along the way. The idea of always staying in dorms and just getting by while traveling the globe does not appeal to me. It reminded me of my first solo trip to southeast Asia and my desire for more travel immediately upon my return. In recent years I have worked hard to improve my lifestyle and I am not willing to give up my cushy life just yet. What if I could maintain my comfortable lifestyle AND enjoy a nomadic lifestyle? Best of both worlds while traveling around the world? I think I should give it a shot. Going nomadic – what does it take to live a nomadic lifestyle? Returning to Austin after my trip to Colombia I kept in touch with several people via Facebook. The idea of the nomadic lifestyle kept rolling around in my subconscious. I found myself exploring the idea while I was researching how to start this travel blog. The blogs that I found most interesting were not entirely about travel. I most enjoyed reading the stories about how people created their travel lifestyle. How do you balance work, personal life, and go traveling around the world? My current client base is around 50% on-site work and 50% remote. I will need to shift all my clients to remote. I was starting to do this already due to the traffic in Austin. I am no longer willing to spend anymore than 5 minutes commuting to a client office. The lost productivity is not worth it to me anymore. When I started my business I would take any and all clients that inquired about my bookkeeping services. Now I have the luxury of choosing what is most beneficial to me and my lifestyle. Speaking of lifestyle, there are cheap places to live and one can be frugal while maintaining a comfortable lifestyle. I do not want to be limited to the cheap places to live. There is a reason so many travel bloggers are living in SE Asia. Initially I think I would like to live and travel around the USA and Canada while I become accustomed to the nomadic lifestyle. I estimate my cost of living will be somewhere between $2,000 and $3,000 per month depending on how many extras I splurge on such as concert tickets or expensive meals. Some people thrive when they have new situations and challenges tossed into their world. Starting my bookkeeping business and my earlier travel experiences have been the biggest contributors to increasing my level of confidence. I have been renting a 2-bedroom townhouse in Austin TX for over 6 years now. I used to make fused glass and enamel jewelry as my creative outlet and I sold the work to galleries around the USA. When the world economy crashed in 2008 – the same year I started my bookkeeping business – my budding jewelry business collapsed along with it. I still have some of the tools and supplies that I accumulated for the business so I need to get rid of those. Access to the internet is the biggest factor when it comes to working while traveling or living a nomadic lifestyle. I have several clients that I work with remotely already and so long as I have internet access I am in business. I upgraded my mobile phone from a Blackberry Tour to the Samsung Galaxy Note 4. I dumped Sprint for T-Mobile so I now have a better service plan and a lower monthly bill. I utilize various file sharing programs via the internet such as Dropbox and Google Drive. Since QuickBooks Online (QBO) updated their service in 2014 I have a growing list of bookkeeping clients that are now switching to QBO. My current travel laptops are an 11″ MacBook Air and an 11″ Acer. I have clients that use QuickBooks Mac as well as PC so I do need both. Working from home the big plus to having two laptops is that I have an extra screen to view files via internet while working on QuickBooks with the other laptop. Going nomadic – what are the pros and cons? The pros and cons of going nomadic will vary depending on who you ask. Some people would struggle with the idea of eliminating the vast majority of their possessions. For many people their home is part of what defines them. I am more of a home is where your heart is kind of person. Possessions do not carry a lot of weight in my world. I am not particularly sentimental when it comes to things and stuff. Although I do treasure the memories that material things can trigger in my mind. Still, I do not need to keep those material things, just the memories and the ability to revisit them. The memories and life experiences are what count the most to me. Looks like the Pros beat the Cons – so far. These are the most important factors to me. I know there are other pros and cons to living a nomadic lifestyle. My only experience dabbling with a nomadic lifestyle was more than twenty years ago and I will have to actually live as a nomad to truly know what the pros and cons are for me. Besides I was not working while traveling around SE Asia for 7 months, I was just a vagabond beach bum. For now I will have to rely on the information from others who live a nomadic lifestyle to help guide me. Going location independent is not for everyone and perhaps it won’t be my cup of tea but I will never know unless I give it a try. Any advice or tips or questions about living a nomadic lifestyle or planning and preparing for a location independent lifestyle are most welcome! I’ve thought long and hard about this – but the reality is that after about 6 months or so of travelling i’ve always settled down in a city to have a base for a year or 2. My partner has done far less travelling than I have – and likes a home base even more than me. The current plan though is to do a Kiwi version of the snowbird thing the Canadians do – 3-4 months in our winter in Asia – possibly doing a house swap. My business is predominantly online too. Thanks for your comment Lis. I do wonder how I will handle the lack of a home base and that is the one thing that I may struggle with the most. I do settle into new places quite easily so hopefully I cope all right. I like your idea of the Kiwi version of the snowbird thing – winter in Asia for a few months sounds like a great plan. I’ve been a snowbird for the past three winters, spending 5 months in a warmer climate (for these 3 years it has been Arizona). While that is not the same as being fully location-independent, it has got me thinking about the possibility of becoming location-independent and travelling more. I’m not sure I want to completely give up my home, but I enjoy reading about others’ experiences. Good luck with your plans. It looks as if you have given this a lot of thought. Thank you Donna. I’m not sure how this will all turn out but I figure I need to give it a try and see how I like it. Being able to take my work on the road is a big plus, the technology keeps improving and making the nomadic lifestyle an easier choice to make. Being from Calgary I can relate to your desire to escape winter and head south! I haven’t spent much time in Arizona but I have seen gorgeous photos, would love to some hiking in the beautiful mountains of Arizona. I have a lot of respect for the people who lead nomadic lifestyles. I don’t think I could ever be on the road full time and while I love to travel, I’m always glad to get home. We sometimes talk about living in another country- but we want to be closer to family. It may yet happen, but I’m not ready. Nomadic lifestyle is definitely not for everyone, and maybe not for me but it will be fun to try it out. The more I think about it the more excited I get about the whole idea. For me the nomadic lifestyle will allow me to spend more time with family in Canada, without actually living there full-time – winter is not for me! Hi Susan – it looks like you are thinking carefully and logically about this decision. My hubby and I are proof that it can be done at any age, and we started with keeping a home base while road tripping around North America. Now we are deliberately homeless and having the time of our lives. Best wishes as you consider your decision. Hi Betsy, so cool to know others that have taken the nomadic route later in life. Glad you enjoying your ‘deliberately homeless’ lifestyle! Yes! Yes! Yes! Becoming nomadic retirees is absolutely the best thing we ever did and we’ve been on the road for 2-and-a-half years now. We went from a cushy lifestyle where the possessions could no longer satisfy the question of “This is it?” to carrying everything we own. Our only regret is that we didn’t figure out a way to do this sooner. Go for it! Nomadic lifestyle, I imagine, is a huge transition. I imagine it can also be gradual. The money angle is a good one but I am sure there are people who have just jumped into nomadicity (my made up word) and figured out how to sustain. Thanks for the comment Charles. Yes I think a lot of people jump into nomadicity (I like your made up word) and just figure it out along the way, and things fall into place. Tempting for me but complicated by my business, and I really like my clients so hopefully I can hang onto most of them and travel full time. It sounds as though you’ve already taken several important steps – from technology to downsizing — towards having a nomadic lifestyle. For me, it was important to keep my health insurance active in Canada so I’ve kept it as a home base. Good luck with your plans and your adventures! Hi Michele, thank you! Yes, good point about the health insurance – that is one of the things on my list to look into. If I spend most of my time the USA/Canada the first year I will just keep my current plan but I need to look into a world health insurance plan too. I will keep a home base in Austin – sort of – with an address for my business, mail, etc and I should probably check-in and meet with clients in person once a year. Conrad and I spent 3 years on the road, made possible in large part by house sitting. And in the last few years of blogging about how to succeed at house sitting, I have met many nomads who prove that it is less expensive to live a nomadic lifestyle than in a permanent home. We found this to be true as well. And of course the large-world benefits are wonderful. I wish you well, and hope you decide to go for it! Hi Josie, thanks for your comment. I hadn’t thought about house sitting gigs – will check out your blog. That would be a good way to secure a place for several weeks or months at a time. Time for me to learn about house sitting! Thanks so much for sharing all your practical thoughts and advice on becoming location independent. It seems like the decision is one also heavily based on emotions and whether someone can flexibly carry a sense of “home” with him/her. Hi Irene, thanks for your comment. I know several people that could work anywhere they like but choose to stay put, simply because they enjoy having the home base. If I had the flexibility of being remote with an income stream, I would love to be nomadic and rent my place out for added income. Austin is nice but the world is so much more attractive to me. I used to have a panic button on my keyboard but forgot to take it off when my old keyboard was recycled! But to the topic, I would find it hard to lead a nomadic lifestyle. I like being home too much. However, do keep us informed as you move in that direction. I think I’ll do a monthly update on how the plan is progressing – that way I will be sure to make some progress each month so I have something to report! My first nomadic experience was for almost 2 years in the late 80s travelling India, Nepal, Thailand and Pakistan. I was in my 30s and sold everything. I eventually went home and started collecting ‘stuff’ again. In 2006, I went again, this time with my husband. We didn’t sell everything, but downsized considerably. That trip in a pickup truck and slide-in camper through the Americas lasted almost 3 and 1/2 years. After 3 years at home and a year spent building a new mobile home we are once again living the nomadic life in South America. Earning money is always an issue – but if you have a dream, then you owe it to yourself to live that dream. We were inspired by my husband’s aged aunt who said: “Don’t say you’ll do that someday, because when someday comes you’ll be too old”. Sorry this got a bit long, but I just want to recommend doing this if your heart is saying ‘yes’! Hi Yasha, thanks for sharing your nomadic experiences and for your words of encouragement! I would love to hear some of your travel stories and will definitely check out your blog. The 80s trip must have been quite the adventure, lucky you to have visited Pakistan as now it is not a particularly safe place to travel. My first trip was to SE Asia for 7 months and I celebrated my 30th birthday in Singapore. Sold most of my stuff and stored some at my parents, felt so good to get rid of everything! Great post. Something I think everyone should be thinking about before taking the leap. Of course everyone has their own comfort levels when it comes down to departing from their accustomed location. I’ve just recently taken the leap and am now living in “one of the most expensive” countries in the world (Japan) – but so far, my most basic necessities (rent, internet, gas, electric, etc.) are actually cheaper than they were in Canada. I can teach English for a couple hours in the evening on the side (there are lots of opportunities), trade stocks and FX at night, and have access to an array of cheap travel options to other parts of Asia (ie: Peach airlines, Airasia) when I decide to just go again. At the end of the day it just made more sense for me to be on this side of the world as I enjoy travelling, eating (better food – in my opinion), and having access to many different environments for a fraction of the costs back home. Anyway, my two cents! Best of luck! Chris thanks for your comment, and congratulations on taking the leap and living in Japan – how exciting for you! Sounds like you have a great life in Japan and you have so many great places to explore nearby as well. And the food! Tasting all the delicious food is a big part of travel and learning about other cultures, for me anyways. Glad you stopped by and commented about your experiences. It is interesting, isn’t it, that a lot of people think you need to save a lot of money to decide to lead a nomadic lifestyle? We have also found that once we paid for our mobile home to travel in our living expenses are much less than they would be at home! Sounds like you made a great decision to go and live in “one of the most expensive” countries in the world. It sounds like you are ready and have looked at all of the angles. We found that the hardest part was just doing it. In addition to your thoughtful post, I read all of the comments. This is quite a group! There are several here that are living a successful nomadic lifestyle. You should go for it. What’s the worst that can happen? You change your mind? Oh well, who cares? I am impressed by your thorough review of the possibilities. Wonderful post. Hi Suzanne, glad you enjoyed reading the post and the comments. I love your advice – and the only way to find out if the location independent lifestyle is for me, is to try it. I have a feeling I will enjoy it and wonder why I didn’t do it sooner. I have been semi location independent for the past 15 years. I do have a base in Korea where I teach 2- 15 week terms, and the rest of the time I am free to do what I want. I sold my property in Canada a long time ago. I’ll probably be leaving Korea later this year, and I am looking to become even more location independent as far as work goes. I’m looking at what I can do online (besides teach) that will give me the money to maintain my lifestyle. I will not become nomadic as such. I will always want a base somewhere. At the moment it looks like Chiang Mai is my choice, but that could change. I plan to continue traveling no matter where in the world I’m based. I just have to get my head around the making a living online part…haha. Hi Nancie, thanks for your comment. The technology just keeps improving for those that want to work online. Being able to live and work anywhere with a decent internet connection is exciting. Chang Mai will be a good place to start your transition to online work as it is affordable and there is good internet. There are certainly plenty of options for you to choose from with regard to making a living online. Think about your strengths and what you are passionate about. Best wishes for a highly successful transition to online income! We are currently living the nomadic lifestyle, we left home 12 months ago and have been travelling since. We are not sure yet if this is a permanent thing but that is open to negotiation. We use a mixture of apartments, housesitting, hostel, hotels etc for accommodation. We do not stick with ‘cheap’ places but go to a mixture of all costs. We find it cheaper than actually having a home but we also do not have an income yet so that part we are still trying to work out as trying to balance work and travel can be challenging. Good luck with your decision it is not easy but remember it does not have to be permanent either give it a go for a while and see what you think. Hi Michele, I think I will have the same approach as you do with accommodation – a mixture of all costs and types of accommodation. Good to know that you have found it cheaper than having a home. I am working on my budget now and I have listed various scenarios, from low-cost locations, more expensive places, and spending time with my parents. You are so right about “it does not have to be permanent” and I need to remember that. I think a good approach would be to think of this as a one-year lifestyle experiment. That would be a good amount of time to adjust and see how I like it. Just want to share our experience. We’ve been slow traveling round the world/been nomadic (whatever you want to call it) for almost 3 years. Well, first year was a strange one: we sold everything and left our permanent home on the East Cost of the US with intention to travel around the US. After crossing the country, we ended up in Seattle. We liked the North West so much (and there was so much to explore during short(er) trips) that we spent a year there. This was an unintentional delay in our RTW travel plans, but about 15 months ago we left the US and been on the road ever since. Our mode of travel is a slow one: we stay in one place from 3 to 6 months (mostly depending on a visa situation in particular country). We both work on the road, but luckily it is completely location independent. However, moving from place to place more often is not feasible and impacts our work schedules. We work 5 days a week and explore our new location on weekends with couple longer trips every once in a while. It worked very well for us in SE Asia and Europe in the past. This year we are spending in South and Central America. 1. Everybody is aware that some places are cheaper and others are more expensive. There are many online resources about this topic. However, these sources should be taken with a grain of salt, because a lot depends on your own lifestyle, budget and a personal level of comfort. Chang Mai in Thailand is universally known for been a very cheap place, but what is “cheap” varies greatly from person to person. 2. For your technology section: good VPN (virtual private network). There are many reasons why it is necessary during travel. Some countries (like China or Thailand) block a lot of websites. Some services are not available everywhere in the world (for example, you can not watch movies from Netflix in Spain). These are just a few examples. VPN would help with these issues. The bottom line: full time travel is not for everyone, but if you are a nomadic spirit it is totally worth it! Elena, thank you so much for sharing some of your experiences on going nomadic. This is helpful to me. When I try to visualize life on the road my imagination starts wandering around and logical me forgets to remind imaginative me that in order to work I need some stability in my life. I like the idea of slow travel and spending a few months in each place. I will definitely start giving more thought to locations that I would like to have as home base for a few months and travel around the area. Medellin Colombia was my initial plan when I started to consider a nomadic life. I also want to spend time with my parents in Calgary so I need to do some serious planning with the timetable especially if I plan to drive around the USA and Canada. Thanks for the info about the VPN – I will add it to my list. I am keeping a spreadsheet with my budget, list of things to research, packing list, etc. I think I will add another section for locations as well. The master plan is coming together and I do enjoy the planning process. It sounds like those are some pretty strong pros and that things are aligning nicely for you to make the big jump. I’ve usually been tethered to a desk and have not had the opportunity to go nomadic, but living abroad brings surprises and challenges on a daily basis that rival those encountered on the road. Thanks for your comment Dave, living abroad definitely brings challenge and surprise into one’s life – I lived for a while in Nigeria and worked in Siberia – quite unusual places compared to my growing up years in Calgary Canada. 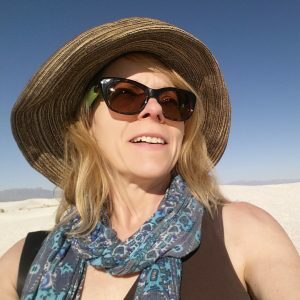 I think maybe my life is a little too predictable right now – time to shake things up and see what it is like to live and work while being location independent. Technology was improved astronomically since my early travels, which makes all this possible. There are a lot of pros and cons to weigh. Personally at 40, I sold my stuff, quit a good job and am now in Goa, India (from the U.S.) and moving on to Varanasi next week. Trying to get stuff done can be challenging in a place without a good infrastructure, impeding both time for fun and actual work. I think if one can balance their time in a place with good services, like Bangkok it can be great for a while. I wouldn’t want to do it forever, it’s a way to break from the 9-5 and do something else. I think a homebase and community of friends/activities is important. Having the FREEDOM to pickup and leave to a new place for a few months is priceless. Meaning have savings, no debt, portable income source, etc. Thanks for you comment Kraven, I just spent some time reading you blog posts about Goa – great reading! I plan to visit Goa but I will likely make it a vacation and not a working location, due to the challenges with electricity, etc. I am compiling a list of places that are known to have great internet access so that I can plan my travels around that – internet is a top priority for me to do my work so I will plan shorter vacation trips for the places with not so reliable internet. Thanks so much for stopping by my blog! Goa is much better for a short vacation, I agree. Even being an introvert myself as well, no homebase tends to be challenging. When you are around ZERO familiar things you start grasping at straws. The other night I found listening to some familiar music on my phone and walking around the sea made a big different, something familiar tied to a positive emotional state. I like the idea of turning to familiar music to sooth the soul. Nature is one of my meditations each day – some people prefer Netflix but I prefer to watch the squirrels and birds, and the trees swaying in the breeze.